At Stikins, we take great pride in providing parents across the UK with school name labels that are designed to stick on and stay on, saving you time and money. We supply our personalised name labels to thousands of happy families across the country, many of whom return to us each year. Tried, tested, and trusted, Stikins is a name that you can rely on to keep your children’s belongings safe! We understand that getting your children ready for term time can be a stressful and busy time. When things go missing, this simply adds to the stress and can even cause upset for your little ones. 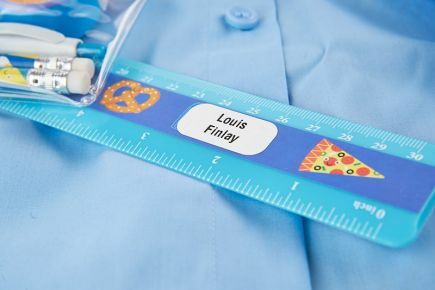 For this reason, we have developed a modern alternative to sew-in name tapes and iron-on name tags; Stikins school name labels that simply stick on and stay on, even when put through the washing machine, dishwasher, tumble dryer or microwave! Thanks to our unique high-strength adhesive, parents can label dozens of items quickly and easily. Stikins can be applied directly onto the wash-care instructions label of garments with no fuss. Strong and resilient, you can ensure that school uniforms, P.E. kits, coats, and even assorted winter gear remain remain safe and secure for the entire academic year! Our school name labels are truly multipurpose; in addition to school uniform and clothing, they can also be applied directly onto water bottles and lunchboxes, pencil cases and stationery kits, books and reading bags, and other personal items – helping to keep your children and your bank balance happy! Order Your School Name Labels Today! Stikins name labels are available to order in four pack sizes (30 name labels for £6.80, 60 name labels for £9.50, 90 name labels for £12.00, or 120 name labels for £14.20). You can order school name labels online, by phone or by post. We print and post name labels every day, Monday to Friday, up to 3pm so your order will be despatched same or next working day. If you would like to find out more about our school name labels, then please contact the Stikins team today! You can also browse our FAQs here or read more about Stikins here. 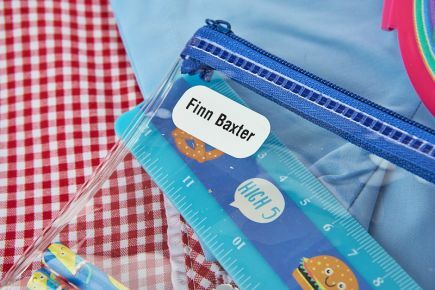 Stikins are suitable for use use as school uniform labels, lunchbox labels, shoe labels, and much more! 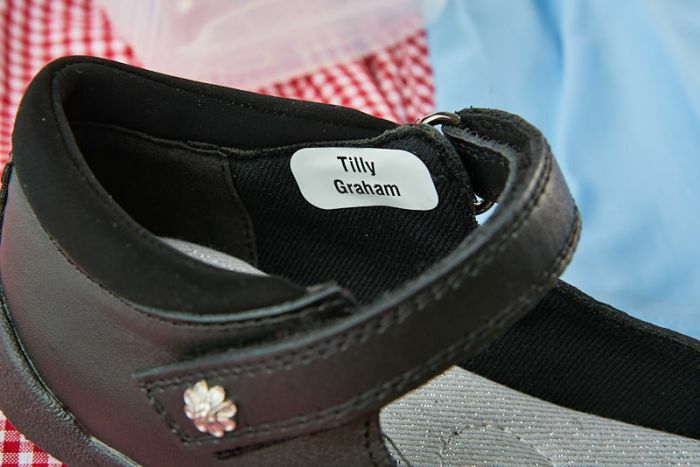 Name labels that simply stick on and stay on - with no sewing and no ironing required! Independently tested for 60 washes at 40 degrees. White name labels printed with a bold black font that is clear and easy for children to read. Our unique adhesive helps to keep items safely labelled all year round. Label all your children's belongings with one pack of stick on labels! 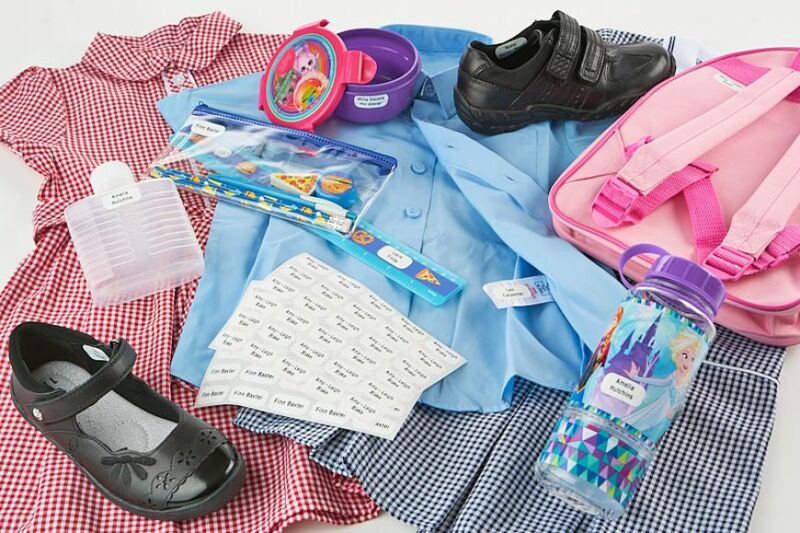 Stikins school labels; make sure that all your children's belongings make it safely to school and back - day after day. Stikins can be used to label school uniform, shoes and bags, lunch boxes and water bottles, and all the other essentials that your children absolutely HAVE to take to school. 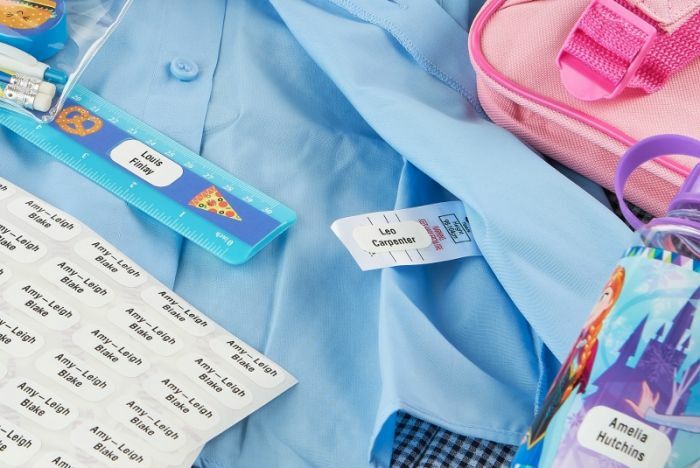 Find out more by reading these reviews and blog posts about using Stikins to label all your children's school uniform and kit. These name labels have been a lifesaver, especially with twins. So quick and easy to use - I can label all their kit for school, Beavers and sports without being up for half the night sewing. I can even get the kids to help, now they are getting older! I was recommended these by my daughter, who uses them on my grandsons' school clothing. Using them on my mother's things and finding them very good, surviving washing well. Superb labels for clothes, bags, drink bottles etc. The One (Hundred and One) Where We Go Barking Mad For Dog-Themed Names! 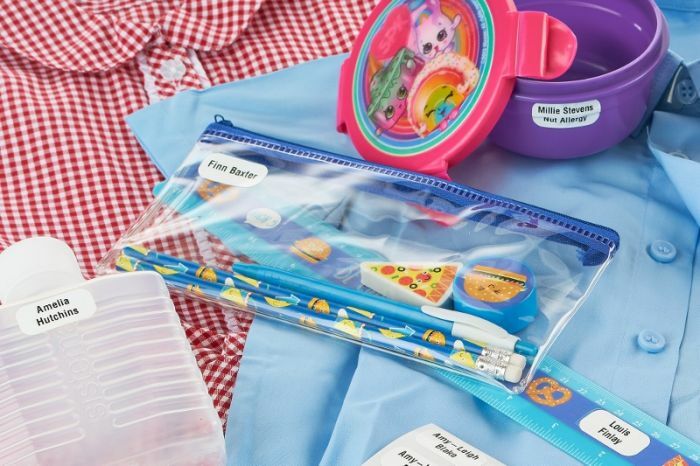 A great product for easy labelling of clothes and school items. Ordering is easy. Delivery is quick. I recommend this product. These labels are amazing! My son started school in September and I wash his uniform daily.. the labels are still on all items, I haven’t once replaced any. Even his water bottle that goes through the wash daily has survived! Just ordered some more for his new set of uniform! We have been using Stikins ever since we heard of them when our daughter started school at the age of 4. The labels are great as they stay on clothes in the wash, but when you need to recycle your clothes it isn't impossible to peel off the labels either. I use them for everything! Clothes, shoes, lunchbox, school bag, and everything taken to Y5/ Y6 camp. It even helped us get a special scrunchie back, as we'd labelled that too! Just wanted to say I love this product. We have even used the stickers on my daughters school waterbottle & they stay on. Also great for the tags in shoes. Fantastic product. Saves so much time. Thanks Stikins!!! Such an easy to use quick solution, peel off and stick onto school item, goes on everything, they’ve been so handy for me, highly recommend!! I’ve used these for the past few years now, they are the best labels by far and last years! I label all my kids school uniform and drink bottles, bags, shoes etc & they never come off despite regular washes and dishwashing! Having tried lots of different labels, I won’t buy anything other than Stikins now! 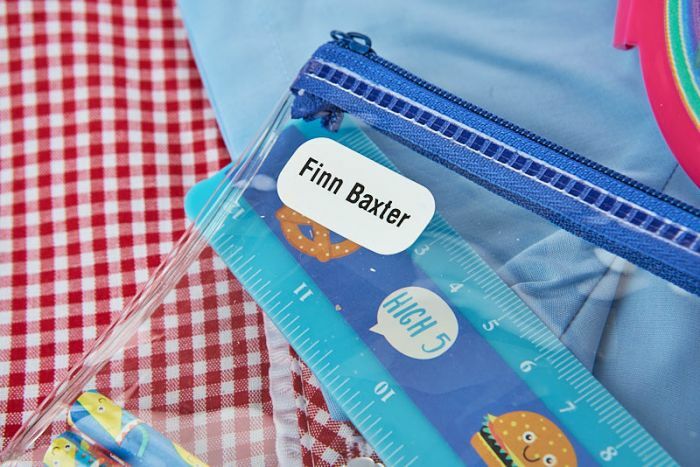 These Stikins name labels are great - school clothes, lunch boxes, bottles etc - great for everything! Best name labels ever! Quick and easy and stick to everything. School uniforms, dance show costumes, emergency service uniforms, lunch boxes, drinks bottles, shoes, coats, books, etc, etc! On our 4th time ordering now and will no doubt be back again! I ordered name labels for my daughter- used it on essentially everything for school, such as school clothes, water bottles, etc. And I have ordered more again as they are durable, still looks new and is still stuck to her clothes despite being through the washer and dryer. Very satisfied. Would happily recommend and will continue to buy. Really love these labels. Have tried various other options to name school clothes over the years, with varying degrees of success and satisfaction. These labels really do seem to do the job - they stick to just about anything, and so far haven't come off or faded despite frequent washes. We're very sorry to hear that you are disappointed with your name labels. The rigorous testing which our name labels undergo means it is highly unusual for them to fail, as long as they have been stuck to the wash-care label, as per the instructions. We would really like to find out what has gone wrong for you; please do contact us so we can help you. Our email address is info@labelplanet.co.uk, or you can call us on 01270 668076 if you prefer. Just ordered our second set from Stikins, and they're brilliant. We've been using them to label everything at school for the last couple of years and they've never come loose, despite repeat washes. They stick just as well on clothes, water bottles, lunch boxes, school bags, shoes, anything we've tried. A brilliant product. Bought as a gift for my grandson who has just joined primary school,such good quality and so handy, im back to purchase more for my children,absolute life saver,and hopefully no more trips to lost property now lol.